Our workforce is knowledgeable on how to dispose of certain items and have good recycling policies to give you peace of mind. 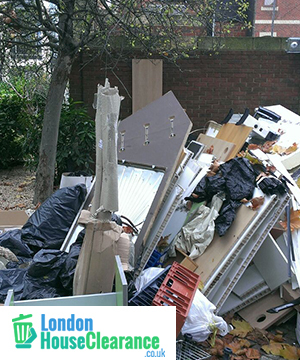 Our waste removal services in London are the best and can dispose of almost anything within reason. Extra cost may occur depending on what you need to be cleared. From a large area to a single item we can lend a hand. We take the hassle out of you doing the task yourself. We have specially designed trucks to cater to all requests as well as special permits for London waste removal. Our costs are affordable so call us and request a quote 020 3540 8016. We may have to arrange a meeting to see first what you need moving. We guarantee all of our services for your complete assurance. This said, we understand that odd one-off tidying can result in a need to clear a lot of waste all of a sudden. At London House Clearance we deliver full-size trucks capable of transporting those bags away for good. Such is the ability of our staff, waste removal can be performed easily across dissimilar items, including furniture clearance among tables, chairs, fridges, freezers and sofas etc. While we value the strengths of each individual staff member, we ask that our workers seek help whenever confronted with large or awkward items. In other words, we discourage individuals from dragging large clumps of foliage along the ground since we know the rear of such a load will likely scrape against surfaces and indeed damage any lawn it might cover. By phoning London House Clearance on 020 3540 8016 you will be able to detail any specific requests across your waste removal London needs before having a quote figure identified. It should be noted that any furniture clearance performed across a space such as the back yard will be cleared up accordingly following shifting. We are careful that no plants are damaged, and will carefully restore those that get brushed during our servicing of the area. We understand that rubbish clearance differs among people and are readily willing to hear of any distinct objects that you may need removed. Need that waste removal done on a specific day, or can't have it done on certain days? We are flexible across scheduling and will do our best to have your wish fulfilled, mindful of any time constraints and matching them to our exceptional speed in delivery. Since most people favour domestic clearance over the weekend, you are advised to call straight away in order to secure an agreeable weekend time slot and should take heed of the demand we receive from elsewhere in regards to Saturday and Sunday appointments. By using only the best in modern means, we have ways of gathering copious amounts of rubbish up before placing them safely in our rubbish removal truck. We utilize large rubbish removal bags and apply safe means in picking up all matter with your safety in mind as much as ours. To have that long overdue waste removal London service performed perfectly, simply call 020 3540 8016 and we will see that all chairs, tables, foliage, sofas, planks of wood, food matter, fridges, freezers, appliances, computers, TVs, cupboards, mattresses and other bulky unmovable objects are whisked away promptly and without damage done to your property.